In years past, we have had lots of very pleasant dealings with men from Hyundai ships but had somehow los t contact with many as crews and officers change. Last night Chim was able to bring 3 seafarers from a new Hyundai ship for dinner at about 9pm. He had told me that one guy was coming but, thank goodness, our friend Usha is here and she made an extra dish. (She made a succulent chicken curry while I made more rice so it tur ned out that we had enough food for everyone.) Old friends, Rommel Vather, and his son, Stephen, dropped by for some Christian fellowship at the same. When everyone was leaving, Chim ask Rommel to pray for the men from the ship. They appreciated the prayer. The men will be back in 35 days, God willing, and Rommel promised to stop by and visit with them again. This pleased the men very much. They get very lonely on board the vessel and this gives them something to look forward to. One of the seafarers, Logesh, had been at our house earlier in the week and our granddaughter, Nina (6 months), surprisingly went straight to him and put her head on his shoulder for some time! We were all quite amazed. This young cadet brought her a little sun suit as a gift last night! We are so astonished when seafarers so often bring us gifts of appreciation. It makes us very humble in our service to them. At the LMM Board on Friday, May 15th, Chaplain Chim told how busy he has been at the Port of Los Angeles/Long Beach recently. He reported visiting a total of 14 ships since the last LMM Board meeting. There was a visitor from First Lutheran in Torrance that accompanied Mary Stewart to this month's board meeting. We had the pleasure of meeting Terry Wall at this session and hope that she decides to join us again soon. She expressed an interested in possibly driving the van once a month to provide transportation for the seafarers but has made no commitment at this time. We would love to have her join our board and we are still actively seeking others to assist us in this once a month activity. Think about it? Chim was recently told by some of the seafarers that 3 of the ships he normally visits are being sent to anchor for 3 months because there is no cargo for them to transport. This contributes to low morale amongst the seafarers at this time of limited job availability. As their contracts come to an end so does their ability to earn a living. Add to that that ships are crewing even more minimally than ever and this leads to further fatigue for the crews! It is more important than ever to be available to the seafarers. Please pray that the Lord would continue to open doors and hearts to the Chaplain. Let's remember Romans 12:5 that affirms that "we are all one body in Christ, we belong to each other, and each of us needs all the others ". 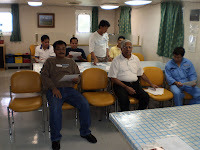 Glad to inform you that Chaplain Chim is back in full swing with the seafarers now . He visits ships and serves seafarers nearly on a daily basis. Yesterday morning he and Rajiv Pathik visited the MOL Presence and held a service for the mariners. 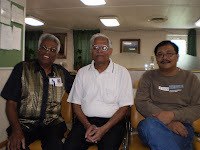 It was a wonderful time for the men on board and Chim came back much encouraged. It was wonderful to have Rajiv and Anna Pathik here for the weekend from the Bay area with their 21 month old daughter, Eva. Good news is that they are expecting their second child come the end of July. 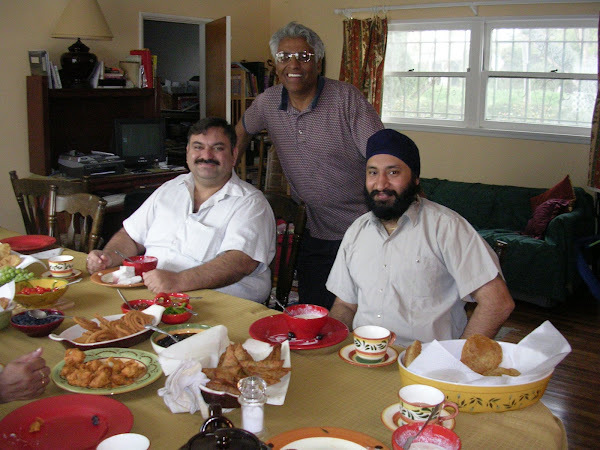 Chim really appreciated Rajiv's assistance over the weekend and enjoyed fellowshiping together. WOW! It's been so long since we blogged that we had quite a hassle trying to remember our password and address! We have been busy getting a hard copy newsletter out to all who are signed up to receive them. It's been 2 years since we published our last hard copy and started using the blog but seems some people prefer the old one. If you do not receive one and would like to get a hard copy, just email us your mailing address and we will add you to the list. There was a seafarer who was left behind when his ship sailed because he had an emergency surgery and was unable to travel. His name is Mr. Chaudhruy. The ship's agent called Chim and ask for assistance in helping him find vegetarian food. We were pleased that he was here for lunch and dinner yesterday. 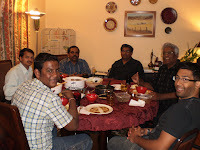 Captain Parekh also joined us from the Presence us for an Indian vegetarian dinner. Chim was able to share the Good News with them both. On a daily basis we are receiving emails from traveling seafarers. We correspond with them and encourage them to seek peace from our Lord. They express their thanks for our prayers for them and look forward to returning to the Port of Long Beach/Los Angeles. On May 2nd, Sadie Mursu, our LMM Board secretary, introduced us nicely at the Women's Cluster meeting at Our Redeemer Lutheran Church in Bellflower. We enjoyed meeting Pastor Mary Todd-Pendergast, who gave a devotional about "new life" from II Cor.5:17. The other women of the Cluster listened attentively as we spoke about Lutheran Maritime Ministry. We are available with PowerPoint and Open Office presentations as needed if you'd like someone to share about the ministry.